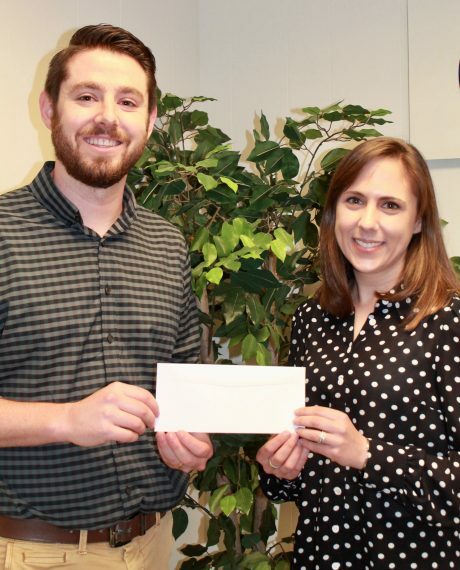 The Fulton Lions Club recently donated $1,000 toward Stone Soup, Too!, a fundraiser in support of local food pantries sponsored by the United Way of Greater Oswego County. The event will be from 11:30 a.m. to 1:30 p.m., April 9 at Fulton’s Holy Trinity Parish, 309 Buffalo St. “For a $5 donation, participants will enjoy a full lunch – from soup to dessert – thanks to local restaurants and businesses,” said Lexie Wallace, UWGOC resource development director. Wallace accepts the check from Fulton Lions President, Zachary Merry. Nonperishable food item donations at the event are also encouraged. Among those supporting the luncheon with food donations are Kathy’s Cakes and Specialty Treats, Blue Moon Grill, Red Baron Pizza, Save-A-Lot discount grocery store, C’s Farm Market, Davis Brothers, Dunkin’ Donuts, Foursome Diner, Kinney Drugs, Mimi’s Drive-In, the Fulton Medicine Place, and Tavern on the Lock Restaurant. “There will also be prizes and drawings at the event and four delicious soups to choose from,” Wallace said. For more information, visit oswegocountyunitedway.org, [email protected], or call (315) 593-1900.